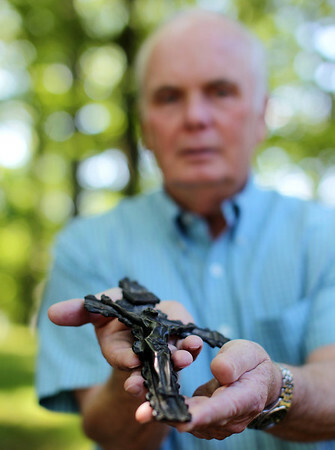 Bob St. Pierre, former Salem Police Chief holds up a crucifix that was found by his grandfather after the Great Salem Fire of 1914. St. Pierre's grandfather returned to the scene of a burnt-out funeral home after the fire to try and find the body of his daughter, who had died before the fire and found a melted crucifix that had been placed with his daughter's body. DAVID LE/Staff photo. 6/20/14.